WHAT ARE YOU DOING VALENTINE’S DAY WEEKEND? Are You on Facebook? Here is the event page! Check Out Our Beauty Filled Pinterest Board! ESSENCE REVEALED – Essence Revealed is first generation Bajan born & raised in Boston. She got her BFA at NYU’s Tisch School of the Arts and MA at NYU’s Steinhardt School of Education. Her writing has appeared places such as $pread Magazine, Corset Magazine, BurlesqueBible.com and 21st Century Burlesque. 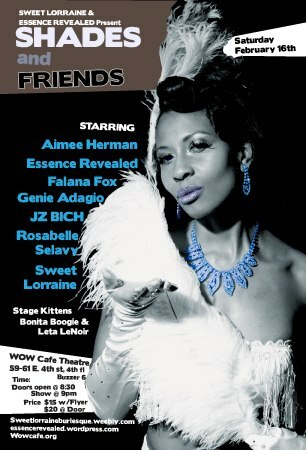 She now performs & teaches nationally and internationally both solo and as a member of Brown Girls Burlesque. Her favorite thing to do besides reading is to lay on the beach in Barbados to rest up for a night of calypso dancing. Beyonce Vs. Rihanna Best Audience Costume Contest! Are You Team Rih or Team Bey? Come dressed as your favorite showgirl and compete to win cash and prizes!